But for people residing in more remote areas, like the townships around London ON, Peterborough, and for those townships when the Toronto folk go cottaging (like Muskoka, Orillia, Parry Sound, Oro Medonte), these are very real problems. Safety tip #1. When there’s a deer or a moose directly in your path, your first instinct might to be to swerve and dodge it. But, that might put you and your family at greater risk for injury. What happens if your car lands nose down in a ditch? What happens if you swerve into another car, or into oncoming traffic thus causing a head on collision. If you can slow down safely, or move to avoid the collision, by all means do so. But, if the collision is inveitable, don’t lose control of the car. 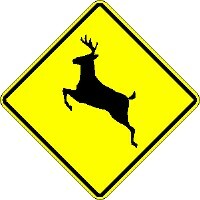 Try to slow down, and if you collide into the deer or moose, then c’est la vie. At least you and your family will be relatively safe, as opposed to putting the safety of you, your family, and other drivers at greater risk. I apologize to the people at P.E.T.A for those remarks , but that’s what we’re taught in driving school, and that’s what traffic police educate the public to do. Car vs. moose or car vs. deer: Car wins, but driver can have some pretty bad injuries foillowing the accident. Trust me. 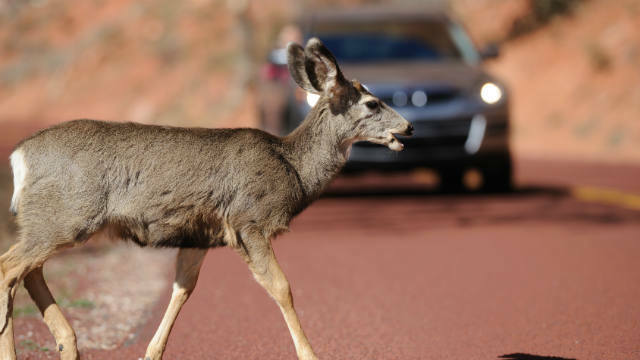 Motorcycle vs. moose or Motorcycle vs. deer: You’d be surprised. Moose or deer usually die, but motorcyclist usually comes out with some pretty significant injuries like broken bones, a spinal cord injury, a brain injury, or soft tissue injuries. I’d say that Moose or Deer win. As mentioned previously, you can’t really sue the moose or the deer. But, you will be able to make a claim for accident benefits from your own insurance company. This is where a personal injury lawyer comes in to play. You see, even if you hit an animal like a moose or a deer and you’ve sustained serious injury, you may be entitled to up to $1,000,0000 in medical/rehabilitative benefits; up to $400/week in income replacement benefits; up to $100/week in housekeeping benefits; up to $185 every 2 weeks for a non-earner benefit; up to $3,000/month for attendant care benefits and recovery of your out of pocket expenses. These are all covered under Ontario’s No Fault Accident Benefit Insurance Regime (SABS as it’s known in the industry). So, even if the at fault party was an animal like a moose, a deer, a horse, or even a tiny rabbit, and you sustained injuries, you may be covered for a variety of accident benefits in Ontario. This is why it’s important to make sure that you’re driving with insurance (that and it’s the law in Ontario). You may laugh or chuckle at the idea that an animal like a moose or a deer can cause a serious car accident. Don’t. We’ve seen some pretty terrible car accidents caused as a result of a moose or a deer getting in the way along a quiety road of an on coming motor vehicle. The pain, anxiety, trauma, fear of driving and depression following a single car motor vehicle accident should not be underestimated. So, the quick answer to the Toronto Injury Lawyer Blog Post question of whether or not you can sue a moose or deer after you’ve hit it is “no”. But, if you’ve sustained injury following such a car accident, you are entitled to accident benefits arising from that car accident. And if you’re own car insurance company is not paying those accident benefits in a timely manner, or at all, then you’re entitlted to sue them for those benefits. You may even have a bad faith claim against your own car insurance company if they’re aren’t treating you and handling your claim witht he upmost good faith. This happens too! From everyone here at Goldfinger Injury Lawyers, we wish you and your families safe winter driving, a Happy Holiday Season, and a Happy and Prosperous New Year. If you or a loved one has any questions about car accident law, insurance law, or personal injury law in general, don’t hesitate to contact our office toll free at 1-877-730-1777 or via email at info@goldfingerlaw.com We would be pleased to assist as best as we can. All of our consultations are free, and you won’t have to pay any legal fees upfront. You don’t have to pay any legal fees until your case settles. If we get you ZERO, then we get ZERO. That’s our promise to you. Toronto’s basketball team has won 5 games in a row? Toronto’s hockey team is undefeated? Toronto’s baseball team is favoured to win the World Series? Pinch me!